This game was long, dare I say even boring at times, and it ended in the Twins being shut out. Not a great way to invest three and a half hours of your time, if we’re being honest. But, there were some moments of hope and baseball, as the game always seems to do, providing some strange performances and plays on this chilly Minnesota evening. You see a lot of weird stuff in baseball, but this outing from Lance Lynn tonight was one of the stranger pitching performances I can remember in a while. He channeled his inner Francisco Liriano, striking out nine batters while only lasting five innings. It took Lynn 105 pitches just to make it that far and only 57 of which were strikes. Lynn walked four batters, but two of the three hits he gave up never left the infield and probably would’ve been outs more often than not. Eduardo Escobar had trouble picking up a slow roller at shortstop and Miguel Sano charged in to field a ball but failed to pluck it out of his glove. It’s always difficult to evaluate performances early in the season, especially for guys like Lynn who sign late, but this cold weather is making it even more difficult to draw conclusions. Lynn clearly did not have great command, he was either having issues gripping the ball or blister problems, but he made pitches when he needed to. You’ll take the five shutout innings any day of the week, but I’d imagine under normal circumstances this would have been an even better outing for Lynn. Or maybe it was just really hard to hit tonight. The teams combined to record far more strikeouts, 23, than base hits, 13. The Twins lost this game because they were 1-for-11 with runners in scoring position and left eight men on base. In both the eighth and ninth innings, the Twins came close to slugging epic homers that would have changed the game (first Sano, then Byron Buxton), but it wasn’t meant to be. They both had the distance but sailed foul. Our friend Eddie Rosario had another adventurous night at the ballpark. In the sixth inning, a hard liner was hit right at him. It should have been an RBI single, but Rosie couldn’t keep it in front of him and was charged with a two-base error. Luckily that runner did not score. In the eighth inning, a long fly ball hit off the wall, but it appear Eddie should have had a play on the ball. I’m not sure if he lost it at the last minute or what, but Rosario whiffed, the ball rolled quite a ways toward the infield and a runner came all the way around to score from first base. I was accused of being unfairly hard on Rosario earlier in the week, so you all are gonna have to let me know what you thought of that play. He had to go a real long way to get to the ball, but it certainly looked to me like it was catchable. And even if he pulled up and just played it off the wall, that run probably wouldn’t have scored from first. Anyway, unlike the other night where we could laugh off Rosie’s antics because he made a huge game-changing throw, things got worse from there. 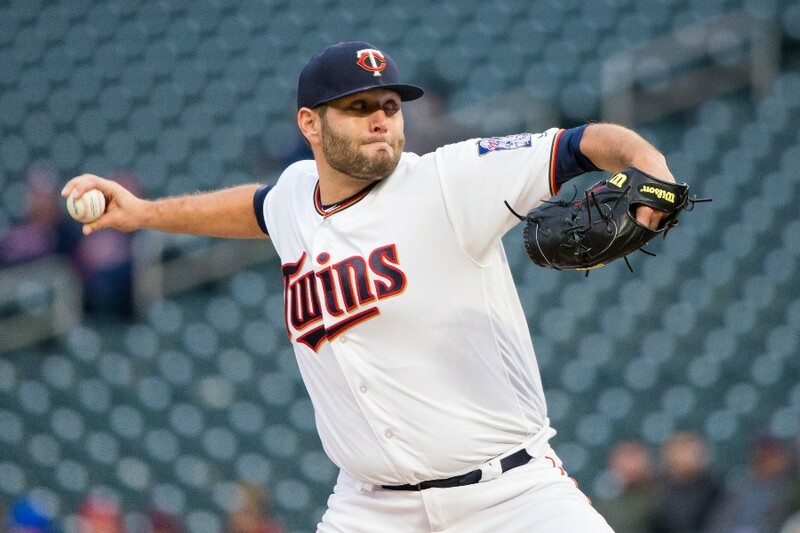 The Twins loaded the bases with one out in the eighth inning and on the first pitch of his at-bat, Rosario hit into an inning-ending double play. Rosario finished the game 0-for-4 with seven men left on base. Joining him in the 0-for-4 club were Sano, Buxton and Logan Morrison, who has started his Twins career 1-for-23. Do you remember how terrible Rondell White’s start was in 2006? Well, he had three hits through his first seven games with the Twins that season. I've about had it with Rosario. I get that he's a free spirit and that's part of what makes him good, but he plays with his head up his arse way too much. I've also about had it with Taylor Rogers. The guy is just about incapable of having a clean outing. He gives up at least one baserunner in about 90% of his appearances since last July. Usually Hildenberger and co. bail him out, but not tonight. I'll take Eddie Rosario every day of the week... Plays hard. He's aggressive. Over-aggressive at time, but incredibly talented. He's also the type of guy who will respond well after a bad game. Yeah, the Defense was shaky, but we all know that he's generally a pretty strong left fielder. Offensively, yeah, he'll be over aggressive, but sometimes that is a benefit. He's a lot like a great closer. Bad game/blown save, come back the next day and do something. Of course, tomorrow that would be against Dallas Keuchel, so it's possible that he's out of the lineup with LaMarre in left. I'll take trying really, really hard and being aggressive any day of the week. Need to practice hitting homeruns around the leftfield foul pole.Come on.Basic. Hildenberger's "usually" was all last year. This year and spring training he has been horrible. Time to warm up in AAA if you ask me. It should have been Russell there, anyway. I mean, the season is like 8 games old, did we not expect Cleveland to be at the top of the stack? Rosario sure had a couple of plays that looked ugly but in cold weather with wind (at least there was a fair amount at my house a few miles away), I'm not going to get too down on him. And in a 0-0 game where the runner scores with a hit, I'm not going to beat him up for going after that ball and then realizing he couldn't catch it and trying to defensively block it from going for extra bases (he failed, of course). All in all, Rosario didn't really change the game defensively. If the Twins don't score, they can't win. He had a pretty bad game but so did several of his teammates. I’m trying to come up with a scenario where it makes sense to bring in Rogers to face Correa. This one gets chalked up to Verlander doing Verlander things. This is why he's one of the best in the game. Our pitching was good enough to win, but we just couldn't figure out how to get that one timely hit. If all three games of this series are close like this one, I'm reassured in that it means our guys can hang with the big boys. On Rosario's non-catch.To me it looks like he just overran the ball (laterally). 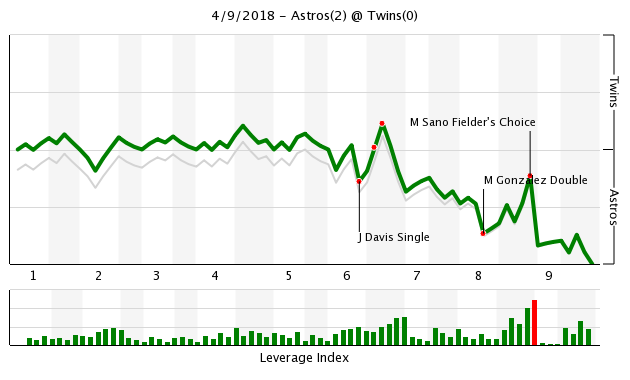 As others on this thread have noted, the Twins did not lose the game last night because Rosario did not make this play, they lost because they could not hit when it mattered.Sano has struck out 47% of the time.Buxton is 2nd on the team with a K% of 29%. The Lomo to Rondell White comparison was brutal and brought back nightmares. Why is a lefty FACING a talent like Carlos Correa in a 0-0 ballgame? Rosario fan here.In most situations I'd rather have an outfielder go for the catch even if an occasional ball gets by him.I see too many where a ball lands in front of an outfielder who doesn't even attempt a catch.However, he's better than what he showed on his attempted catch by the wall; he missed a potentially catchable ball by a good couple of feet.Seems like he should have at least had a glove on it. And Buxton hasn't had all good at bats but it seems like he's hitting into bad luck when he does barrel one up (liner to short and potential hr just foul). 100% agreed. Going back to the 2nd half of 2017, Rogers has been one of the Twins' worst relievers. The Twins aren't short on bullpen arms, I also have no idea why anyone else wasn't pitching to Correa. Rosario: he hasn't been smooth out there, but the guy wants to win and CAN hit. Remember that throw a couple of nights ago in Pittsburgh? C'mon, give him a break. Sano striking out 3 times: barf. The Twins offense in general: terrible. Silver linings: Buxton has gone 0-4 his past two games but has NOT struck out in any of those at bats. He's putting the ball in play, that's huge. Those grounders are going to turn into singles real soon gang. Lynn: Hey, we'll take it. LoMo: Remember the Kendrys Morales experiement?This feels way too familiar.LaMarre & Grossman should be splitting at bats at DH right now. Get Kennys Vargas warmed up down there in Rochester. This was his 4th screw up in the OF already over this young 8 game season. When can we get down on him? I also can.not.wait for the cold weather excuses to end. The issue that I have with the cold weather excuses is that both teams are playing in the same conditions. 1.) No problem on the ball in. I want him to be aggressive on that in the situation. Would've been nice to see him lay out and I wonder if the cold plays a role in him not. 2.) He seems to be having some issues with the Target Field wall this year. Seems like a coach should take him out and give him some reps - he's definitely having trouble finding the track. 3.) No issues with Rosario hitting into a double play. He hit the ball hard, he just hit it right at someone. The shift works, the shift works. You could argue he should try to coax a walk but in a 2-0 game with LoMo up next, I like him being aggressive. Sometimes the process is good but the result is not. 4.) Surprised there hasn't been more on this about LoMo. He's looked awful and seems like he could use a day or two off. His at-bats aren't even looking good. Seems lost. Eddie has his ups and downs. LoMo just has downs. Verlander is a tough pitcher and he was on tonight. Not going to say this game is evidence the Twins offense is terrible. LoMo has a career OPS+ of 108, he'll be better than this. He's just really slumping. He looks like he's pressing at the plate, a few days off might do him some good. It does seem like the "This is Joe's Last Year, It's Logan Morrison Time" train of thought has stalled. Last year, what, Houston scored 40 runs over three games in Minnesota? I like our team. But we didn't have a good night. Rosario is fine on defense. Last week he won a game in Baltimore with one throw. I wish he would not have swung at the first pitch to him in the 8th. If it's a curve, let it go on the first pitch. Houston was hoping he'd do that with the bases loaded. But, the one that got me, the one that I screamed on was Mauer's swing and miss against Verlander. One thing about Joe, he does not swing at balls out of the zone, and it was a fastball that started out of the zone and went down from there. He hits Verlander pretty good usually. Then Sano gets screwed by the umpire, three pitches outside the zone and he's down 1-2. Liked our chances against the world champs with their ace on the mound. Oh, I'm not saying anyone else needs to share my viewpoint. I'm only saying it's early in a season with some legendarily awful weather. I'm going to give pretty much everyone a pass for these first couple of weeks.